This Wednesday night we hold the Heaps Decent annual showcase in the Danceteria. To get you in the mood and provide a taste of some of the amazing talent coming out of the weekly workshops we have The Heaps Decent Allstars mixtape. Each week the emerging artists attend recording and production sessions with leading Sydney producers, DJs and musicians in the Redfern community centre which is an intensive collaborative and supportive atmosphere for all involved. The result is a number of high quality tracks, with inspiring improvement amongst the driven attendees. 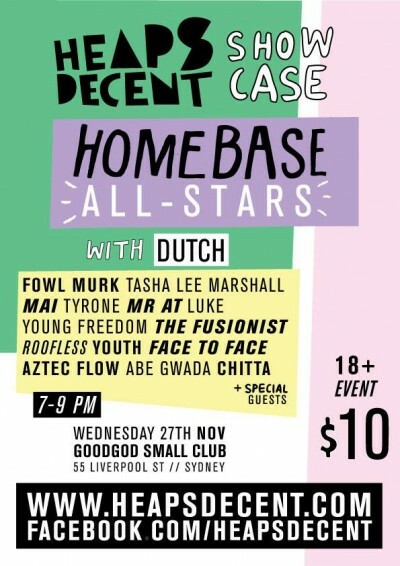 Come and check out the showcase, as the HOME BASE ALL-STARS light up the stage this wednesday night.